If you have a good knowledge of fabrics and you happen to find a fabric you like, you may bring it to us. However, sometimes it might not be a good idea to supply your own fabric because it might not suit the style you have in mind. Also the yardage you need depends very much on the style and your size, therefore if you really want to purchase the fabric, get more than you think you need (at least one yard extra), it's better to end up too much than too little. If you are going to supply your own fabric, stay away from fabrics that are too delicate and won't performs over time. You are making a solid investment in a garment which should last for decades, a fragile fabric will severely cut the lifespan of the garment. You may bring in magazine clippings, your own sketch or some garment you wish us to copy. 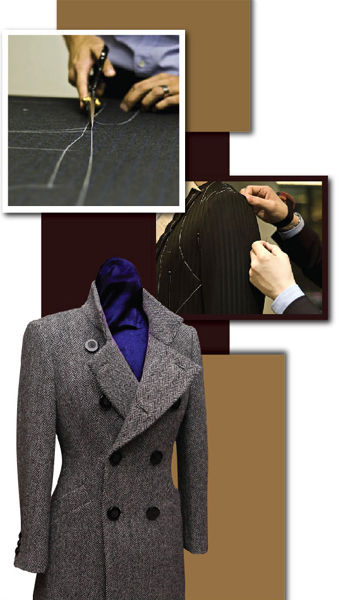 Note that with your own body and different fabrication, a designer style will be an adaptation not exact replica. We make the garment so it suits you and fits you properly; it may look different on you than it does on a model in a photograph. When you come for fittings, avoid wearing anything that is too heavy or too baggy. Also, wear the type of undergarments that you are going to use with the clothing you ordered. Wear the type of shoes you are going to use with the clothing for fittings. It would help you to better visualize the length of the product. Mention whatever you like or you don't like on that clothing that is being fitted during the fittings. Something like the jacket length and the pocket position cannot be changed in the later stage; speak up and speak out - we want you to be happy!